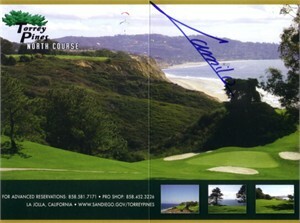 Torrey Pines North Course golf scorecard autographed in blue marker by PGA Tour superstar Camilo Villegas. ONLY TWO AVAILABLE FOR SALE. With certificate of authenticity from AutographsForSale.com.